If there was one food I could never give up it would be pizza. Pizza is a never ending journey of creativity. This is why I truly love it. You can make it for breakfast, lunch or dinner and top it with well, anything. My mouth never stops watering for it! In fact I could eat it every day. You might think there is just New York style or Chicago style or some version of a crust, plus a tomato based sauce, and mozzarella. While this is an essential staple in your pizza repertoire it is only the beginning point. Open your mind and your stomach to what pizza can be and try a new one every week. First things first get a pizza stone. It’s a must for a crispy crust. Size matters if you want a thin crust. Go big. Then get a pizza cutter and kitchen aid mixer if you want to save yourself a ton of time. Its an investment but remember this is just the start of your pizza making days! Combine the yeast, sugar, flour, salt in your kitchen aid. Slowly combine. Add the water gradually until the dough begins to form a ball. Coat a bowl with oil. Place dough in bowl, and cover with a warm damp cloth. Put in a warm spot to rise until double in size, about 1 hour. When the dough has doubled in size, punch the dough, scrape it onto a cutting board with olive oil and knead it lightly into a smooth ball. Roll it out and place on a hot pizza stone. Preheat oven to 500 degrees or your grill. Now get creative! My latest love was an olive oil base topped with caramelized onions, gruyere, mozzarella cheese and prosciutto. 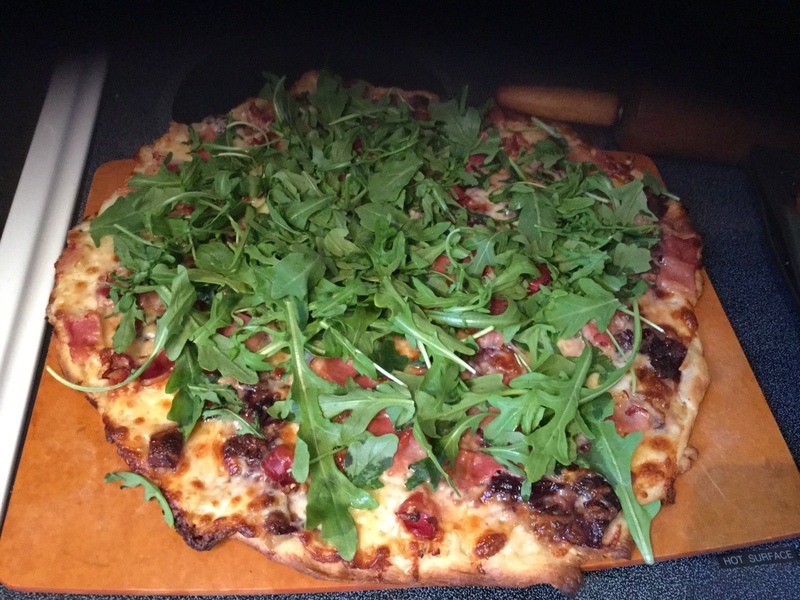 Then I topped this one with arugula. I don’t exactly time cooking my pizza. I watch for my crust to bubble, look for the crust to crisp and I just know it’s ready. I let it cool for a few minutes before cutting. Then I embrace a little bit of heaven. I can’t wait for this Saturday’s pizza night! What should I try this week? Tell me your favorite in the comments below. My fav would be the 3 kind of mushroom, arugula and olive oil pizza that they serve at Brixx but your recipe could easily help me duplicate it!! I’m with you! I love pizza: cheese pizza, veggie pizza, breakfast pizza, dessert pizza…Ahhh the possibilities are endless.